Along its more than 4,300 km., the Chilean geography encompasses an incredible variety of climates and landscapes which together with the country's development in many areas, have turned Chile into a favorite tourist destination throughout the World. In fact, in mid-2016 Chile was recognized for the second consecutive year as Leader in Adventure Tourism within South America by the World Travel Awards, known as the "Oscars of Tourism". Based on these achievements, this 2016 and for the first time, the country has been nominated to receive the same award but this time recognized worldwide, not only among the South American countries. In relation to this issue and to the direct flight announced by an important British Airline which will connect London and Santiago 4 times a week from 2017, "The Telegraph" published a list of 21 reasons to vacation in Chile (and there are more than 21), but to split hairs, here is a list of my 5 most recommended places to visit in Chile, the classification is random. It can be said that the modern Chilean capital is a privileged city, located in the middle of a fertile valley surrounded by vineyards and where there are wonderful places to visit. 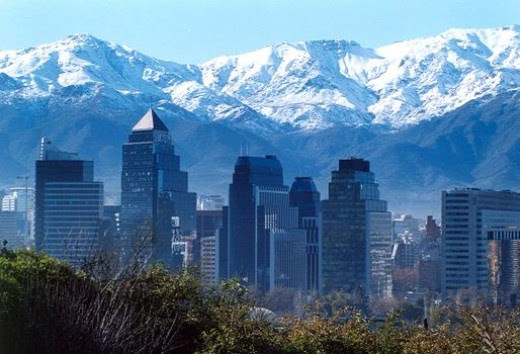 Santiago, with the exception of the National Congress, concentrates most of public bodies and is the cultural, economic and financial center of the country. In winter the population suffers the ravages of the lack of winds that clean the air, however it can also be said that its location is advantageous because it is less than 2 hours from the coast and even closer to the Andes, so you can enjoy either the beaches in Summer or the snow during the Winter without having to travel long distances. In recent years Santiago de Chile, owner of a booming economy, has created cutting edge museums, elegant hotels, sophisticated restaurants, modern residential neighborhoods and business centers. Among the must-see places to visit in Santiago can be mentioned Palacio de la Moneda (Government Palace), full of historical-political events today known throughout the World; the Centro Cultural Palacio de la Moneda, located under the Plaza de la Ciudadania, opposite the south facade of the Government Palace; the Plaza de Armas, surrounded by ancient buildings like the Metropolitan Cathedral, the Municipality of Santiago, the Museo Historico Nacional; very close is also the Casa Colorada, today converted into one of the numerous museums of the city. Other renowned galleries are the Museo de Bellas Artes (Museum of Fine Arts), Museum of Memory and Human Rights, the Pre-Columbian Art Museum, Natural History Museum, La Chascona House- Museum (former house in Santiago of the Nobel Prize for Literature Pablo Neruda), Museo de la Moda (Fashion Museum), and many others. A few kilometers East of the city in the mountainous region are the most important Ski Centers of Santiago that are the best in the country. These winter sports complexes are internationally renowned not only because of the quality of the snow, but also due to their modern infrastructure and comprehensive services provided to the visitors. We are talking about the Winter Resorts of Farellones, El Colorado, La Parva and Valle Nevado, not to mention a little further North Portillo Ski Center. Other visits that can not be missed are to the Mercado Central, one of the typical places of Santiago, mostly frequented by tourists, where you can taste typical dishes especially from the vast Chilean sea; Cerro Santa Lucia, which provides one of the most beautiful views of Santiago and Cerro San Cristobal, nestled within the Parque Metropolitano, the largest in Latin America. I can not fail to mention Barrio Lastarria, a place unique for its green areas and beautiful mansions of the nineteenth century, now restored and used mostly as theaters, cafes, restaurants, bookstores and museums. favorite of artists and intellectuals; Barrio Bellavista, one of the main bohemian neighborhoods in Santiago. A great option for the children and also the adults is a trip to the Zoo, one of them is the Zoologico Nacional, in an unique environment at the foot of Cerro San Cristobal. In the commune of Buin, you can visit BuinZoo, the largest in Chile with over 12 hectares and more than 2,000 animals in a specially adapted habitat, according to their characteristics. The Chilean wines are famous throughout the World, and the Metropolitan Region is one of the most important wine-making regions of Chile. There are several tours, generally known as the "Wine Route" touring ancient vineyards, its facilities and manor houses. In summary, in Santiago de Chile not only you can explore its ancient buildings of the old town, craft centers, beautiful parks and plazas, museums, shopping malls which are among the most sophisticated in the World but also in the surrounding area there is a huge variety of places such as the Ski Resorts listed above, Nature Reserves and National Parks. Most of these and other places can be discovered through the many tours offered locally and over the Internet. Easter Island, or "The Navel of the World"
Located in a remote area of the Pacific Ocean, the Province and Commune of Easter Island is considered one of the most interesting tourist sites in Chile, for the enigmatic stone sculptures known as Moai and the mysterious legends and traditions of the ancient Rapanui culture that, until now, it is not known exactly how it almost disappeared. Nowadays the small population of just over 5000 inhabitants is composed of approximately 60% of Chileans coming from the continent while a 40% are of Polynesian origin. 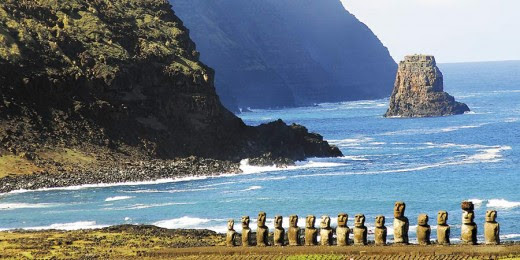 Easter Island or Rapa Nui in native language, has dozens of attractions, the time needed to visit all the places is around 3 or 4 days, but if you want to explore the volcanic caves you can spend a longer time on the island. Without a doubt, the main attraction to visit around Easter Island are its more than 900 stone statues called Moai, many of them grouped in a sort of altars known as Ahu. But there are other amazing places to explore as the impressive volcano Rano Kau with its crater of 1600 meters in diameter; the ceremonial center and archeological site of Orongo; Rano Raraku volcano, known as the "quarry of the Moai", another impressive place of Easter Island; Te Pito o Te Henua, a large round stone representing "The Navel of the World", name given by the natives to their land; the dormant volcano Maunga Terevaka, with 512 meters high, the highest elevation of Rapa Nui, from where you can see almost the entire island; Ahu Tongariki, one of the most impressive ceremonial platforms throughout Easter Island; the spectacular beach of Anakena and Ahu Nau Nau, two of the most beautiful and emblematic places of "The Navel of the World". Patagonia is a binational region, shared between Chile and Argentina, in the South American southern cone. Not for nothing Forbes Magazine, highlighted this part of Chile as one of the top 10 destinations in the World for nature and photography lovers during the year 2016. In addition, Lonely Planet, the World´s largest travel guide book publisher chose Aysen, in the northern part of the Chilean Patagonia as the sixth best region of the World to visit in 2017. Many are the stunning places that could be mentioned, however among the most emblematic are Parque Nacional Torres del Paine, declared by VirtualTourist in 2013 "The Eighth Wonder of the World" with million votes through an online poll; the Carretera Austral (Southern Highway), a road of a little more than 1,200 km. considered one of the most interesting, attractive and beautiful routes of the Americas; a visit to Punta Arenas, the southernmost continental city in the world, on the shores of the Strait of Magellan, full of a rich history of immigrants, nowadays gateway to the Chilean Patagonia, Tierra del Fuego Island and the Antarctic Continent. The Atacama Desert, in the extreme north of Chile stands out for being the most arid of the planet and one of the most famous tourist destinations for its salt flats, geyser fields, hot springs, beautiful landscapes and its immense archaeological wealth. The region of Atacama has a great number of magical places to visit, among the must-see spots are Geysers del Tatio (El Tatio Geyser Field), the largest group of geysers in the southern hemisphere and the third largest in the World. Another attraction is Valley of the Moon, located 13 km. of San Pedro de Atacama, small village considered the archaeological capital of Chile. Valley of the Moon is famous for its conformation similar to the lunar surface. It should be noted that Atacama has been a testing ground for NASA to check some of its robotic exploration vehicles. Other places of tourist attraction of the area include Laguna Cejar, sinkhole lake famous for its great concentration of salt which allows to float effortless; The Salar de Atacama (Atacama Salt Flat), of 100 km long and 80 km wide, is one of the main attractions of Los Flamencos National Reserve, the Flamingos arrive from the most remote places to nest and feed in their "eyes of water", such as the Chaxa lagoon. The Atacama region is also known for having the cleanest sky in the world, unpolluted and generally free of clouds. Not for nothing the main astronomical observatories of the World are installed in the North of Chile. For this reason, in San Pedro there are many agencies offering the already famous Astronomical Tours, which consist of taking you to the Desert, (away from the lights of the town), to observe the firmament with powerful telescopes. Another great attraction of Northern Chile is Father Gustavo Le Paige Archaeological Museum of San Pedro de Atacama, an extraordinary exhibition that summarizes 11 thousand years of the local culture. Among the interesting pieces, there is a mummy popularly known as the Miss Chile, with well-preserved hair and eyelashes, about 4,000 skulls, innumerable other mummies, weapons and valuable objects on display. 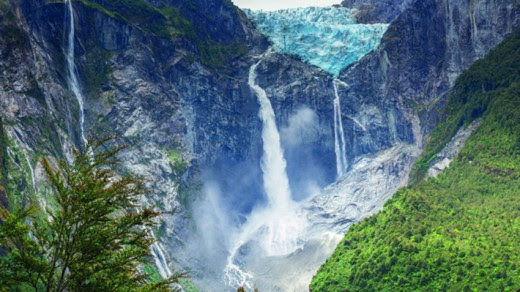 Southern Chile (region located immediately north of Patagonia) is one of the favorite destinations of travelers from Chile and abroad, endowed with fantastic landscapes composed of mountains, snow, lakes, lush forests, and a profuse variety of flora and fauna. The nerve center is the "Región de Los Lagos" (Region of Lakes) or Chile's Tenth Region, although the bordering Regions of "La Araucania" (or Ninth Region of Chile), Los Rios (Region of Rivers) and Archipelago of Chiloe highlight locations of exceptional beauty as well. Without a doubt, the city and commune of Pucón is one of the most important tourist destinations in the South of Chile, where you can find travelers from all over the World, attracted by the lake and the ascent to the top of Villarrica Volcano, historically one of the most active volcanoes in South America. In the foothills of Villarrica Volcano, is located Pucon Ski Center, considered by many as one the most beautiful places to practice Winter Sports in Chile. 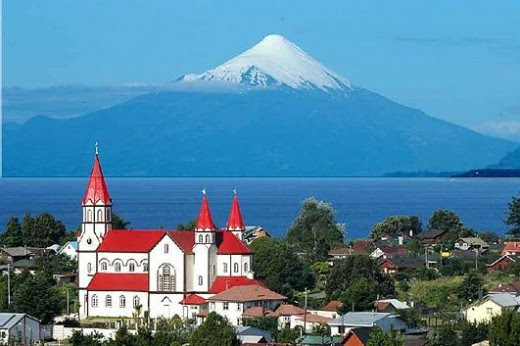 You can also visit dozens of small villages founded by German settlers on the shores of so many beautiful lakes among which can be mentioned Puerto Varas, Frutillar, Puerto Octay, further North the town and resort of Lican Ray and many others. A special mention deserves Huilo Huilo Biological Reserve, a huge 100,000 Hs. private park on the shores of Pirihueico Lake, several times awarded by international institutions due to its sustainable tourism practices. Needless to say that the facilities of the Reserve as well as the landscapes of this part of Southern Chile are magnificent. Another of the must-see places in the South is the Chiloé Archipelago, group of islands of great attraction for having its own culture, full of myths, legends, traditions, folk music, gastronomy and beautiful landscapes. Further North, in the Region of Bio Bio is located Nevados de Chillan Mountain Resort, with the longest piste in South America (14 Kms.) Hotels and Thermal Baths nestled in the mountains.